Who stayed up last night for the draw? I liked the live draw, using the trophy itself, and it was an excellent way of including sponsors early in the process besides showing the draw to ensure fairness. Now, as for the structure, it's a classic. Eight groups, one seeded member in each, playing round robin, top two from each advancing. Smells to me like a world cup standard (soccer, rugby, MRDWC, etc...), so nothing unusual going on there. The odd thing to me is the re-seeding after the first knockout round. The top 8 teams are already seeded. Thus, the winner of group 8 is the #1 seed throughout, winner of group 7 the #2, etc. A re-seeding runs the risk of introducing random error due to the fact that teams are ranked equally on points against unequal opponents. That said, I doubt it'll pose a serious issue in determining the World Champion. Let's start with the most balanced, possibly most exciting group in the tournament. NZ are the lowest seed, thus we can expect they're closest in skill to the unseeded teams. According to Flat Track Stats, NZ haven't bouted since the last world cup, but they did quite well there, beating Scotland and Germany and holding France and Sweden to respectable scores. The other three are hard to predict. Norway has defeated Denmark and lost to France and Wales had a tough run in the Road to Dallas tournament in Newport, losing to West Indies, Scotland, and Ireland, as well as defeating Ireland in an earlier friendly. South Africa is a major X-Factor; they've never bouted any other nation. They could be like Men's Team Japan, and come in still learning the game, but it's more likely that they'll be more like Men's Team Argentina, shocking their group to the core. I can't wait to watch this one! It's a few of my favorite rugby nations, favorite anthems, and the haka, all in one group! France has a long record, one of the longest in the event. Although they have suffered heavy losses to the major powers, they also deliver that kind of punishment to the minnow nations. Expect the tricolor to be flying over Dallas all three of their group-stage bouts. Brazil is coming off an un-won 2011 world cup, but has that experience to draw on. This group is statistically interesting, as it's highly unlikely that the only two Portuguese speaking nations would be drawn against each other. The conversation on the track will be awesome in that bout! Sweden are fun to watch, especially against Finland! They've got a 5-6 record in international bouts, with many of those bouts coming in very close at the end. They've also been one of the teams challenging USA outside the world cup structure, and this can only help their preparation. West Indies recently performed well in the above-mentioned tournament in Newport, taking third. Their team comprises some of the best skaters from top leagues in the UK, so they are a credible threat throughout the world cup. Neither Chile nor Japan have bouted yet, but I rank Chile higher for the sheer number of actively bouting leagues in their country. However, Japan have the benefit of training with Men's Team Japan, who learned so much in such a short time at the MRDWC. Expect that experience to shine through from them on the track! That said, there are no regional rivals in this group, making it another quality group to watch. That's part of the fun of the World Cup--mix it up and see what happens! This is the group of death. Every world cup has one, and this is it. This group almost defies prediction! Finland, the seeded team, have recorded wins against Sweden and France, but those are lower seeds. As well, those were all fairly narrow wins, with 31 being the highest score margin. Scotland will be coming into this tournament hot on the heels of defeating Ireland, Wales, and West Indies in Newport, as well as a reasonably good record in the 2011 event including the "point heard 'round the world." Mexico and Colombia are hard to predict, as well. Mexico have an absolute gold mine of talent, with leagues up and down the nation. Colombia are a derby nation as well, and their national team is coming off a hard-fought loss to rising power Argentina. If there's to be a major upset in this tournament, Group 4 is the most likely spot for it. Finland does not have a secure lock on that top spot, and all three will be gunning for them. Every bout here will have the potential to be a make-or-break! That's all for now, the remaining four groups and the knockout stage will be analyzed in future posts. I hope you find this interesting and informative. Please don't hesitate to comment if you have information that may confirm or refute these predictions. E.T.A. : All score data is from FlatTrackStats.com. If it's not there, I likely don't know about it. If anyone has access to score data not there, please email it to roush.adam.h@gmail.com. Thanks! 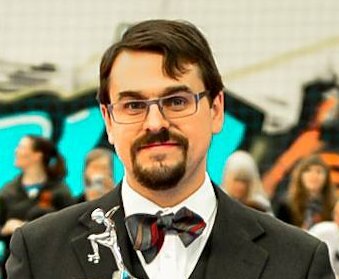 Stat Man is an announcer, tournament planner, and analyst. He proudly chairs the MRDWC, as well as planning broadcasts and keeping people informed about derby at all levels. Get Ready for Season 12! Nossas impressões sobre o Violentango 3! So – you want to get better at roller derby? Who Will SUR5 This Weekend? BRDG Merch Shop Is Live!